Verizon Wireless on Wednesday announced that it wants to help ease the excessive cost of overseas roaming with a new 100MB Global Data Plan set to roll out on April 23 for $25. The new service will offer customers based in the U.S. coverage in 120 countries across the globe, including all of Europe, South America, the Caribbean, Mexico and Canada. Verizon customers will need to meet certain requirements to be eligible for a Global Data Plan, the carrier said. Only those with pre-existing domestic data packages and international eligibility can sign up, which requires good standing bill payment history. Verizon also said that customers who go over the allotted 100MB will receive an SMS notification offering up an additional 100MB of data for the same price of $25. Unless you plan to do a ton of Web browsing and emailing, 100MB should be plenty for a two week vacation in Europe. Basking RiDge, N.J. – Summer travel season is just around the corner, and Verizon Wireless is setting sail with a new, easy-to-understand Global Data Plan. Starting April 23, the new Verizon Wireless Global Data Plan offers U.S.-based customers 100 MB of data for $25 a month. For one low cost, customers can access email, browse the Web and update social networks while traveling outside the United States in 120 countries and destinations, including all of Europe, South America, the Caribbean, Mexico and Canada. With the new Verizon Wireless Global Data Plan, customers can purchase 100 MB of data for $25 a month. Prior to traveling outside the United States, customers should visit www.verizonwireless.com/global to determine their coverage needs. To purchase a Global Data plan, customers are required to have a domestic data package and international eligibility, which requires minimum payment history. Customers who require more than 100 MB of data while traveling will receive a notification via text message when an additional 100 MB of data for $25 has been automatically made available to them once they exceed their initial allotment. Customers traveling to countries not covered under the Global Data Plan, but within Verizon Wireless global coverage areas, will be charged at Pay Per Use rates of $0.02 per KB. Whether traveling to London for the big games this summer or Oktoberfest in Munich this fall, Verizon Wireless customers with global calling and data services can make and change hotel reservations on the fly, call for and download directions to local attractions and restaurants, and stay in touch with family and friends back home by sharing pictures via email and social networks. 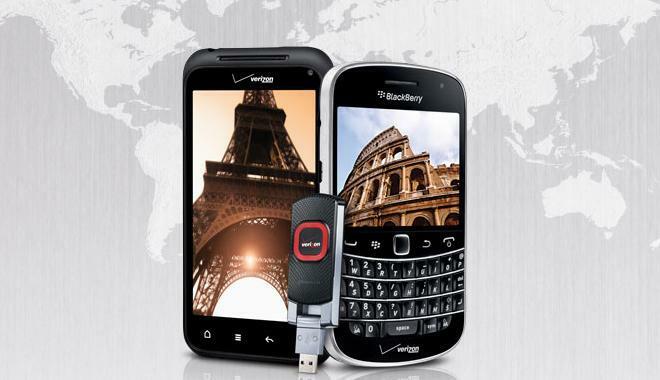 Verizon Wireless offers a wide range of global-ready devices, including smartphones, tablets and mobile hotspots. Customers can shop for global-ready devices at www.verizonwireless.com and select "Global Ready" when sorting devices by feature. Verizon Wireless Trip Planner provides customers information they can use to plan their travels before they leave home, including details about global calling, country-specific coverage and device functionality. To help travelers get their wireless bearings, Verizon Wireless greets travelers to most overseas destinations with a free welcome text message featuring helpful information for the country they are visiting, including dialing instructions for calling within and to phones outside the country; voice, text and data rates; as well as the ability to reach Verizon Wireless Global Technical Support. Free Global Data Roaming Usage Alerts help travelers keep an eye on their wireless usage. Verizon Wireless customers automatically receive free alerts via text message or email when Global Data Roaming charges exceed certain thresholds. Verizon Wireless operates a dedicated, toll-free global support number that will put customers in touch with one of the company's U.S.-based support centers 24 hours a day, seven days a week. Customers outside the United States can reach the Global Technical Support Team by dialing the appropriate exit code for the country they are in and then 908-559-4899 – a free call from their device. Customers may also reach Global Technical Support free of charge by using the Verizon Wireless Global Calling Card, provided with their global-ready device, if their device is not usable. For more information on Verizon Wireless global products and services, visit a Verizon Wireless Communications Store, call 1-800-2 JOIN IN or go to www.verizonwireless.com/global.